Keep reading after today’s recipe for dozens of other fabulous cookie recipes, and to enter to win one of the FOUR giveaway prizes! Thank you to Ellen at Family Around the Table and Christie at A Kitchen Hoor’s Adventures for hosting #ChristmasCookiesWeek. Can you believe this is my THIRD Christmas blogging? I can’t. In 2016, I published my very favorite cookie recipe, the chocolate crinkle – absolutely my holy grail of cookies. In 2017, I poked it and came up with a fun variation with mint. And this year, I’ve continued the crinkle cookie tradition with a ginger crinkle cookie! These are very simple but very delicious. 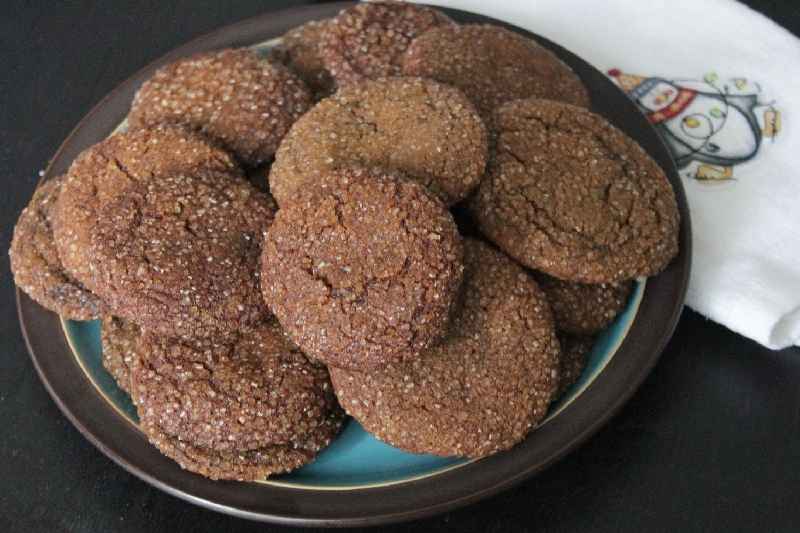 They have molasses and a generous helping of ginger and cinnamon and they are so dark and soft and warm and lovely. They taste like an evening on a cozy rug in front of the fire, even when it’s 80 degrees out (Florida, get it together!). I’ve called for two kinds of sugar in here: regular granulated sugar for the batter, and raw sugar for the outsides. If you’re not familiar with raw sugar, it’s a less refined version, with a more molasses-y taste and larger crystals. It’s also called turbinando or demerara; you might have seen it in the little packets for coffee with the brand name Sugar in the Raw. 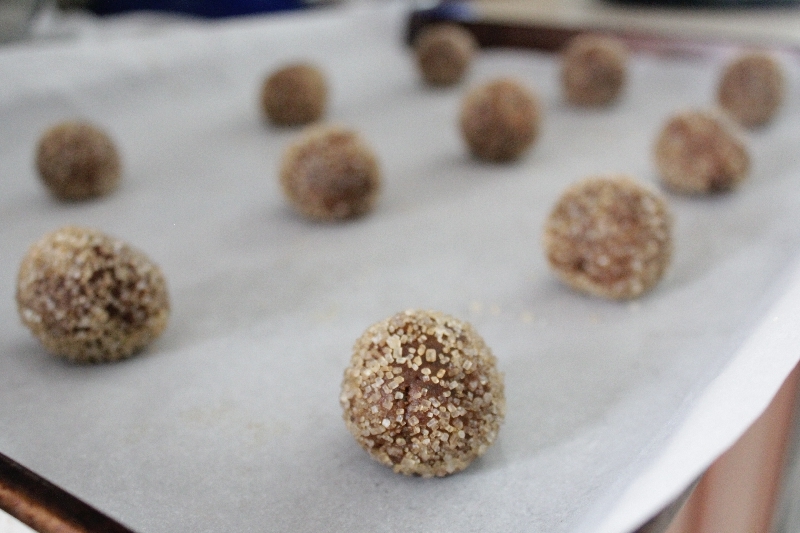 If you only have either granulated or raw sugar, this recipe will absolutely still work. I recommend both because the granulated sugar dissolves better in the dough, but the raw sugar adds this glorious sparkle and crunch. If you compare this recipe to the chocolate crinkles one, you’ll notice that they are fundamentally a bit different–this one uses butter, the other oil. As such, the cooking directions are different too. Notably, this one requests that you leave the cookies on the pan for a couple of minutes after coming out of the oven. This is important! When I moved a few to the rack right away, they got too much air circulation and got a bit crispy on the bottom. You could do that on purpose, but I really love these as a soft cookie. 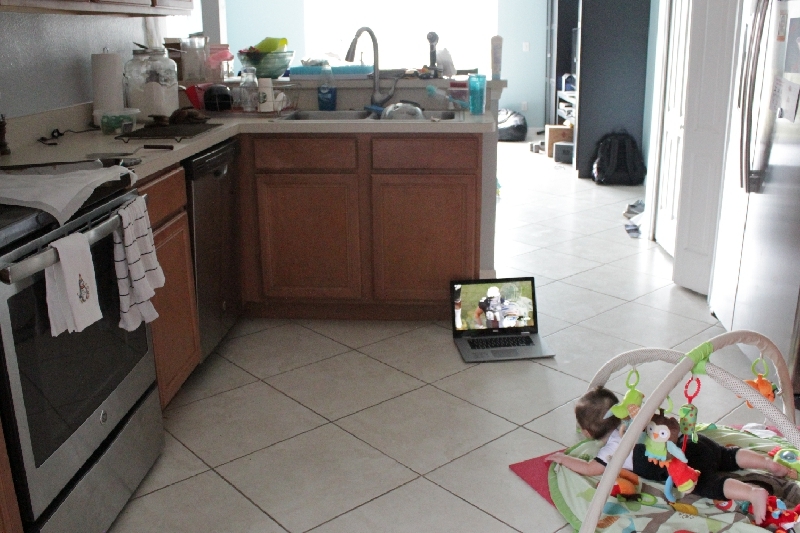 Also, this is what happens when it’s Saturday, you have to bake AND photograph two cookie recipes, the game is on, and the baby needs to be entertained. If I’ve only learned one thing about parenting thus far, it’s that the change is constant. Blogging didn’t use to involve a play mat in the kitchen! Beat butter and sugar until soft and fluffy. Beat in molasses and egg. Stir in flour and spices until well blended. Preheat oven to 375F. Cover a couple of baking sheets with parchment paper. Pour raw sugar into a small bowl and place on your work space. Roll dough into balls about 1.5″ in diameter. Roll in raw sugar and place on baking sheet. Bake 8 minutes. Allow to cool 2 minutes before moving to cooling rack. I’m posting twice this week, but Christmas Cookie Week lasts through Friday! Check out the Facebook group for more fabulous recipes all week. Hop back to the Monday post, featuring Peanut Butter Cutout Cookies, for descriptions of the FOUR prizes!